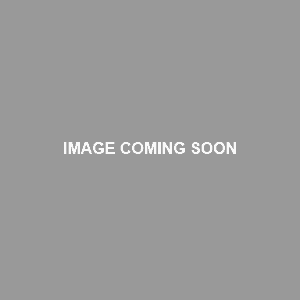 The middle trapezius (G. trapeza, four-sided or four-legged table.) refers to the middle section of fibers in the trapezius, between the upper and lower trapezius fibers. It acts on the scapula and is the prime mover in scapular retraction. The middle trapezius is grouped as a superficial posterior axioappendicular (extrinsic shoulder) muscle. It’s situated between the top of the shoulders, and lies superficial to portions of the rhomboids, latissimus dorsi and infraspinatus. It arises from the top five thoracic vertebrae. Its parallel-oriented fibers extend laterally and insert along the top of the scapular spine to the acromion process. The middle trapezius, in conjunction with the upper and lower trapezius, takes on a radiate muscle shape. Unfortunately, the middle (and lower) trapezius fibers don’t get the respect they deserve. Most people mistakenly believe the upper traps constitute the entirety of the trapezius. And it’s a damn shame, I tell you! Note: The table below only includes back exercises with a focus on scapular retraction, which is the main action of the middle trapezius. I should point out that these are the exact same exercises that target the rhomboids. The mid traps also get trained, albeit more indirectly, in rear deltoid exercises (and to a much lesser extent, in lateral deltoid and anterior deltoid exercises). Also, note that most of the different T, W and I exercise variations can be done unilaterally. 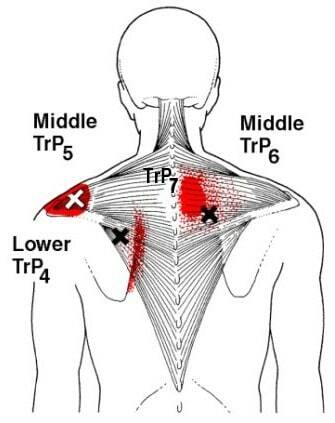 When using these techniques, give special attention to the trigger points labeled TrP5, TrP6 and TrP7 in the image below. Inhibited/Lengthened Middle Trapezius: The middle trapezius fibers are inhibited and excessively lengthened in individuals with upper crossed syndrome (UCS). The scapular protraction associated with UCS puts a constant direct pulling force on the middle trapezius, since its fibers running horizontally between the upper thoracic spine to the scapula. As you can imagine, this causes the mid traps to become chronically lengthened and inhibited over time. This in turn can reduce scapular retraction range of motion, leading to improper technique on rowing movements and poor mid-back development. It can also increase the risk of injury on bench press, since you need keep your scapulae squeezed together tightly to keep your shoulder girdle and torso stable while benching. If you can’t do this correctly, then it’s only a matter of time before you get some kind of shoulder injury. Strengthen the middle trapezius by performing more direct exercises. Start with a simple activation movements like the incline T raise and incline shrugs to get a feel for proper scapular retraction. If you were previously doing some kind of bent over row exercise, switch to a seated cable row if possible, and use significantly less weight than you would normally use (e.g. 20-30%+ decrease). This will allow you to focus on scapular retraction and build up the middle. If you don’t have access to a seated cable row machine, then keep doing bent over rows with significantly reduced weight. Once you’ve improved your scapular retraction control, you can start increasing resistance and adding more technically difficult middle trapezius exercises (e.g. face pull, prone cobra, t-bar row). Release and stretch the pectoralis major, pectoralis minor and the latissimus dorsi. These muscles, which are very tight and short, are the main culprits responsible for pulling you into the hunched-over posture that’s stretching out your lower traps. Since your middle trapezius weakness most likely stems from upper crossed syndrome, it is necessary to correct the other issues contributing to this postural dysfunction. For specifics, see how to fix upper crossed syndrome (article coming soon). Most people have a tendency to elevate their scapulae during scapular retraction exercises. As such, it’s necessary to depress scapulae during the movement by isometrically activating the lower trapezius. However, if you are in the minority of people who tend toward excessive scapular depression, then it’s necessary to activate your upper trapezius to elevate your scapulae closer to neutral (i.e. they shouldn’t be completely depressed, nor completely elevated). Don’t allow your thoracic spine to hunch over. Keep it upright throughout the movement. This enables proper scapular position against the ribs, which is necessary for efficient movement. As you lower the weight during the negative, let your scapulae “glide around your rib cage” (credit to Mike Robertson for that cue). Your mid traps and rhomboids should do the majority of the work. Not the arms. If you’re unable to fully retract your scapulae, and if you can’t “feel” your upper back muscles working, that means you need to reduce the weight and work on your form. Reduce the weight to an amount that allows you to squeeze your shoulder blades together at the top of the rep for a full second. This will teach your body how to better activate the target muscles. Once you’re able to do that, it’s not necessary to hold the weight at the top for that long. Hello, I needs pictures next to the exercises. I have no idea what they are. It says they will be posted soon. Thanks! Hey, this website is pretty dope. Never knew the mid/low traps were so important, I hope to fix my proximal short bicep head inflammation by fixing my posture one step at a time. Thanks–I’m pumped that you like the site so much! I originally found out about the importance of lower/mid traps through lots of research a few years ago after struggling with bad posture and shoulder discomfort. I knew I had to spread this info to more people, so I’m glad you found it and think it can definitely benefit your situation. or the lats! Supraspinatis yes,, lev scap,, yes,, and all those splenus and semis and mayube serratus post and ant…. I am not seeing the images either. Is there another way to get them to show up? Hi Joe, Sorry — but I never got to taking the photos. It’s still on my to-do list. You should be able to find most by Googling the name — if not, just ask me what the specific exercise you’re looking for, and I’ll send a link or a photo.